More than half of consumers who took part in a loyalty survey in 2013 admitted they had abandoned at least one loyalty program in the last 12 months1. Perhaps more significantly, 85% of millennials (with their expected annual spend of $200 billion by 20172) expressed negative sentiment towards loyalty programs on social media3. This indicates that loyalty programs do not guarantee loyalty to your brand. To build real brand loyalty, you need to focus on building customer engagement. Customer engagement—the customer’s willingness to continue interacting with your brand—is driven in large part by providing an insight-driven, high-quality customer experience. As customers are driven up the engagement ladder, there is greater opportunity to gain insight into their attitudes and behaviour by applying smarter analytics to the ever-growing customer dataset. The more engaged the customers are, the better you can tailor the experience to fit, unlocking lifetime value. If your only two-way interaction with customers is at check-out, you will only know what the customer purchased—you’ll never know why, and you won’t be able to take action on what you’ve learned. Smart marketers recognize the opportunity to understand the customer better by aggregating and combining internal data sets (like Point-of-Sale and CRM data) with external data sources (like social media and online reviews). 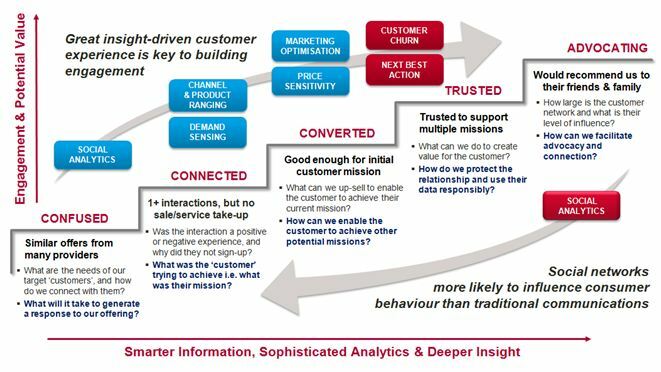 Customer analytics techniques are then used to harvest the data for insights into the customer mission i.e. what they were trying to achieve when they bought the product, and therefore, what other products might be relevant to that mission or other related missions. For example, customers whose purchases indicate they are mid-way through a mission to redecorate their dining room might be more responsive to an offer for dining accessories than to one promoting bedroom furniture. Changes in the digital technology landscape have disrupted traditional push-based approaches to building relationships with customers. Technology-savvy consumers now expect the companies that they choose to do business with to be able to deliver compelling and consistent communications across all channels. Brands that do deploy relevant and timely communications through the right channels will generate interest, interactions, or even sales. Each interaction can serve as a stepping stone to a purchase as well as a data source for improving customer experience if companies are able to capture and analyze the data generated during those interactions across social, web, and contact center channels. Conversations can be analyzed using techniques such as Natural Language Processing (NLP) to provide insights into which products to promote across which channels, and what impact those tweaks are likely to have on sales performance. ‘Hunches’ can then be tested in order to improve conversion rates of both future and follow-up campaigns. How many companies have you interacted with over the past 12 months? How many of those would you trust to use the data they hold on you in a responsible and intelligent manner? I suspect the answer is very few, if any! Leading practices suggest that trust develops incrementally over time as a result of companies taking relevant, timely, and value-adding action consistently across all customer touch-points. Taking into account what stage the customer is at during their purchasing decision journey, the best way to boost loyalty may be to prioritize communications that provide inspiration or help customers get the most out of their recent purchases. It can also add value to prompt customers for information about their attitudes, needs and aspirations, or even to back off and do nothing! This is characterized as a Next Best Action strategy. Prevention is always better than treatment, and implementing Next Best Action is an effective approach to retaining your most valuable customers, turning them into brand advocates, and tapping into their social networks. However, don’t confuse Next Best Action with Next Best Offer. Addressing customer needs intelligently doesn’t mean shoving offers at them but providing them with the right content or interaction to deepen their loyalty. The pharmacy chain Walgreens provided a good example of this shift in mindset when it launched a program to encourage its members to adopt healthy lifestyle practices. The program allows members to connect their digital health trackers with the Walgreens mobile app. Members are awarded points whenever they engage in a healthy activity5. Customer data is of course the lifeblood of such a strategy and requires a blend of historical customer interactions and transactions, as well as contextual data sources covering lifestyle, interests, consent, sentiment, geo-location and web browsing behaviour. Prescriptive analytics is the science and art that then translates these data points into statistical models and business rules that capture insights that lead to profitable, customer-focused action. Tools and techniques are emerging to enable these deeper insights into customer behaviours and attitudes. However, the perennial challenge remains how to bring your customers along on this journey. This is about people transformation as much as technology transformation, and requires you to win the battle for hearts and minds, switch the conversation towards building customer lifetime value, and invest in change management. Delivering the vision in small bite-sized chunks and proving the value along the way is likely to be more effective than a traditional long-term program. Winning companies in the future will be those that have the courage, foresight, and agility to develop a customer engagement strategy based on insight and customer-centricity. This article was first published on Clarabridge’s Blog.